Every life experiences loss. Those with two parents for much of adulthood are blessed. 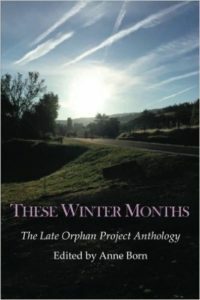 Writer Anne Born pulled together a collection of essays about the loss of a parent during adulthood. I am fortunate to have an article included, which I’m reprinting below. “You are just like your mother.” A college friend of mine tossed this pejorative my way. My mother and I shared few common attributes. She paced herself and moved with caution; I run. She did one thing at a time, always linear. I multi-task, weaving a path of destruction like a buzzing bumblebee. Mom focused first on her family. While I love my husband and child, I struggle to balance my career. Mom’s last decade challenged the entire family. She had vascular dementia, a brain disease that stole her from us. We lost our companion, mother, sister, grandmother, aunt and friend, minute by minute, hour by hour, week by week, month by month, year by year. She was present, but not there. My father insisted we include her in everything, even when she could not take part. When she died four years ago, I was relieved. Her quality of life had diminished. Dad found her daily care challenging. Close to the end of her life, Dad could no longer lift her from her chair. Mom moved to a skilled nursing facility for her final three weeks. Mom shook with tremors and tiny strokes. On the evening she died, I felt like the next candy pellet in the top of a Pez dispenser. It was my turn now. I was the matriarch. Who am I now? Who am I supposed to be? What can I take from the life of my mother? That night, I made a conscious decision to let go of some of me and be more like Mom. How funny that 32 years before, hearing “You are just like your mother” offended me. Now I would give anything for some of her attributes. She was not perfect; we were and are both complex, flawed creatures. Mom suffered from depression. Her troubles began shortly after I started high school and ended around the time of the birth of my son. Her first grandchild. When I was small, my mother was the perfect stay-at-home mom, as if plucked from central casting for a situation comedy. With her delicate features and porcelain skin, my petite mother had classic Jackie Kennedy looks. From birth I was heavy, a chubby infant never outgrowing baby fat and towering over the elementary school boys until eighth grade. Mom never said anything bad about anyone; I am gifted in the art of acerbic sarcasm. I only heard Mom swear once. A cousin called during dinner to report her father’s death. Mom said, “Sue called,” and burst into tears. My dad, brother, and I laughed because we had no idea what Mom meant. Mom said, “Damnit, Sue’s father, Mr. McLaughlin, died today.” We all knew this was serious. We were insensitive and wrong. I’m working on the colorful language, being less colorful, that is. As a sales rep, I channel Professor Harold Hill from The Music Man and the players from Glengarry Glen Ross. Mom’s kindness resulted in lifelong friends. She was in a literary sorority, volunteer groups, church groups. She supported my father’s work and community activities. Mom led Brownie and Cub Scouts, chauffeured us, baked school cakes and cookies, and hosted slumber parties. She was often silly and loved silly songs, poems, and stories. She colored with us, played Hide and Seek, and read from the scary Fairy Tale Anthology with the gory color pictures of ogres and trolls. Mom was a second-grade teacher with a reading specialty degree from Indiana University. When she was pregnant with me in 1956, the Swayzee School Board retired her at mid-year. How untoward for second graders to see their teacher in a hatching jacket. She had married my dad a scant eighteen months before. In the past four years, I’ve worked hard to channel some of Mom’s excellent attributes. As a social media user, I often know when someone has died or is ill. So, I send the card or flowers or make the call for the entire family. I make a point to nurture my lifelong friendships. What is better than the comfort of talking with an old friend? I stay in touch with some of my mother’s friends. Mom was always the first to suggest a party; I’d rather stay home and write. So, for my dad’s 85th birthday, I phoned my brother, and we planned a party for December. I did the invitations, and my brother took care of the photographer and the catering. After the party, I sent pictures out to family and friends, just as Mom would have. On Dad’s 50th birthday she had a surprise party for him and rented a wheelchair. She thought it was hilarious. Mom was a good listener; I’m a terrible listener. It’s hard to hear what the other person is saying when I’m talking about myself, or talking about my writing. I am working on it; I’ve made myself more self-aware. Two profound legacies come from Mom’s illness. Witnessing my mother’s decline, my husband and I decided now is the time for travel. We don’t know if the clock is ticking for me, or for any of us, for that matter. Since 2011, we’ve visited ten European countries. We’ve ridden in a gondola on Venice’s Grand Canal, eaten paella cooked outside in Spain, watched the Changing of the Guard in London, and viewed Van Gogh’s “Sunflowers” in Amsterdam. The second legacy is the completion of a circle I did not foresee. When I was 25, my mother was at her worst with her mental illness. I lived in Florida, hundreds of miles away from my parents in the Midwest. On an ordinary spring day, Mom was unsuccessful in a suicide attempt. I immediately flew through the night to her side. Mom was in a medical hospital and dismissed to a psychiatric center twenty miles away. My father had a difficult time with this. During his childhood, a family member had a breakdown and was removed by force to the local jail. It was up to me to handle the paperwork, talk to the admitting people. I worked in a hospital, and I knew the drill. It was not easy for me, either. I didn’t understand the concept of the locked facility. I hardly handled it when we left her behind in the sterile, concrete building. The metal door slammed shut and locked us out – my petite, beautiful mother left inside. Mom got better. Before she died, she enjoyed watching her grandsons grow up until dementia stole her memories. I lost my long-time job in 2009, and when faced with the rotten economy and lack of employment, I freelanced for five years. This gave me more time to help my father with mom. The economy improved. I needed full-time work. In February 2014, I started working at a psychiatric hospital and addiction treatment center. This is mom’s last legacy to me: when a family member picks up that phone and calls my office for the first time and asks for help for their loved one, I feel their pain. I have great empathy for the patients we serve. Our facility is beautiful and has amazing therapists. I wish Mom could have benefited from it. Once in a while now, someone I’ve known all my life will say to me, “That’s something your mom would do.” Nothing pleases me more. If you liked this story, please share. This independent writer appreciates your help in building her audience.